For many of us the idea of spring cleaning has already begun to creep back into our minds as winter draws to a close. It’s been a pretty hectic winter season with all sorts of weather conditions battering our homes relentlessly, so the idea of spring cleaning might be quite an encouraging prospect in most cases. 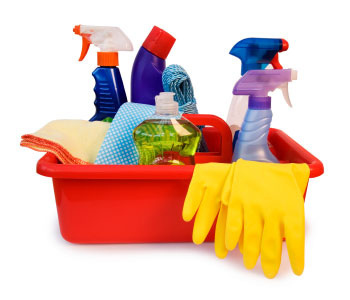 Have you ever wondered whether there’s an idyllic cleaning checklist to go by each year? Maybe it’s your first time experiencing the demands of spring cleaning? Whatever your situation is, here are a few things you’ll need to cover to get your spring cleaning started. Stains and unpleasant odours are the first things you’re likely to notice as you venture throughout your home. Dealing with odours is usually a simple case of applying some air freshener, whilst stains are a bit harder to deal with. You can get in touch with experts such as Apple Clean who offer a stain removal service all over the South East. Start by vacuuming your carpet thoroughly and follow this up by searching for any stains that weren’t there before. The quicker you deal with these stains the better. Next, introduce some new rules for a more consistently clean home such as taking shoes off. Depending on the room, shelves play host to all sorts of different items from standard ornaments to books. To make everything look a lot neater, try reorganising your shelves in a different way or maybe even look to install some new shelves if the original shelving is a bit too crowded. What you want to avoid when polishing certain materials, especially silver, is using a product that’s too abrasive. Some metal restorers will use a toothbrush to polish silver using a solution that’s water-soluble. Make a checklist of each room you’ve already been through, or you could just collect all your silvers, steel and other cherished materials together at once. Sometimes your cushions or furnishings are beyond repair and need a complete overhaul to look anywhere near as good as they sued to be. To save time and effort, you could just get hold of some new furnishings. This gives you the chance to be a bit more flexible and maybe adjust the theme and appearance of the room. It’s not particularly difficult to clean these two areas of the home, so you can quite simply go around with a standard window cleaning solution for your conservatory doors and windows. The trouble with walls is that they often deceive us. Clearer walls might have stains that are tough to spot, so make sure you thoroughly check your walls and use a soaked sponge with a tiny bit of dishwashing solution to combat them.